I have been doing my holiday baking. I tend to make the same favorite cookies every year and then try a new recipe. This year, for my vegetarian friends and family, I wanted to make a GF Mallomar that had homemade marshmallow cream without animal gelatin. I used the traditional whipped egg white base, but replaced animal gelatin (Knox unflavored) with a kosher unflavored gelatin (Gefen Jell Dessert). The only kosher gelatin I could find in a store near me was really unflavored jello which is meant to make a large bowl of jello not to help things gel. This kosher gelatin is made from a seaweed, carageenan, and includes sugar and other ingredients. Some kosher gelatin is made from fish so be sure to real the labels if using it for a vegetarian. I was not sure how much to use to replace the plain gelatin. I reasoned that one Tbs. may not have enough of the gelling ingredient because of the other fillers, so I decided to use 2 Tbs. of the kosher jello and one tsp. of xanthan gum. It worked like a charm. The marshmallow whipped up much faster than regular gelatin. The texture was great, soft, fluffy and smooth. When set the marshmallow had a nice spring to it. The Mallomars came out wonderful. I piped out little marshmallows with the extra cream. Then, after setting for several hours, I coated them with confectioner’s sugar so they would not stick to each other. These will be perfect in hot cocoa or just for eating plain. First make a recipe for Gluten Free Graham Crackers. Then make the recipe for Vegetarian Marshamallow Cream below. Enough for 2 dozen cookies. Line baking sheets with wax paper and place the cookies out on the baking sheets. It is necessary to have everything set up to pipe out the marshmallow cream quickly, as soon as you finish beating it. The marshmallow will set as it cools and become impossible to pipe out. In a small or medium saucepan combine the water, sugar and corn or golden syrup. Bring to a boil and continue stirring and heating the mixture until it reaches the temperature of 235 degrees or the ‘soft-ball stage’. Use a candy thermometer or an instant read thermometer to check the temperature. When the mixture is nearing the 235 degrees temperature mix the kosher ‘jello’ and xanthan gum together in a small bowl. Add the 2 Tbs. of water and mix well. Allow to sit. When the hot sugar mixture reaches 235 degrees remove the pan from the heat and place into the sink. Add the ‘jello’ and xanthan gum mixture to the hot sugar mixture and stir. Set aside. Beat the egg whites to the soft peak stage in a stand mixer or in a large bowl with an electric hand mixer. Add the hot sugar and ‘jello’ mixture to the whipped eggs and continue beating until stiff peaks form. This will happen much faster than with regular marshmallows so keep an eye on the mixer. 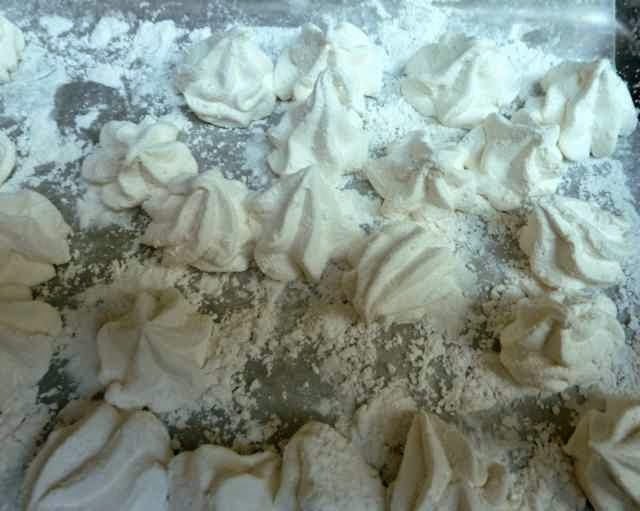 Vegetarian Marshmallow Cream beaten until stiff peaks formed. Transfer the marshmallow cream to a pastry bag fitted with a 1/2-inch round or star tip. You will probably have to refill the bag at least once to use all the cream. Pipe out mounds of the marshmallow onto each cookie. I made “kiss” shaped mounds with a star tip. Marshmallow cream piped onto cookies. Leave the marshmallow topped cookies to set at room temperature for at least 2 hours. Avoid touching the marshmallow as it will stick to you and anything in its path. Left over cream can be piped out into kiss shapes on wax paper that has been dusted with confectioner’s sugar. When these set, dust the tops with confectioners sugar so that they will not stick to each other and store in the fridge in a baggie or container. These are great in hot cocoa or just plain. 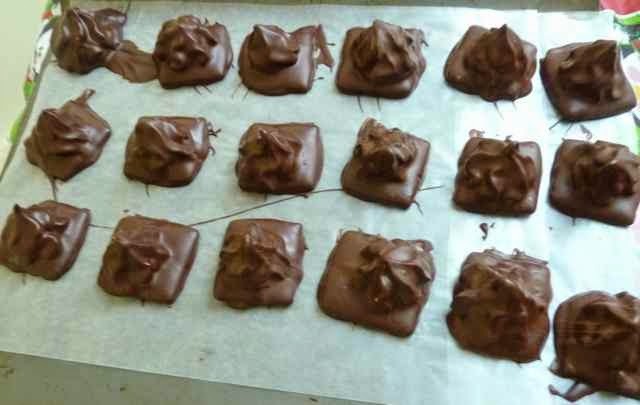 You can even dip some in the left over chocolate after dipping the cookies. Marshmallow cream piped out onto waxed paper dusted with confectioner's sugar. C) After the marshmallow has set, dip the cookies in chocolate as per the directions on the GF Mallomar page. Enjoy! Cookies dipped into chocolate on waxed paper waiting for the chocolate to set. VEGETARIAN MALLOMARS First make a recipe for Gluten Free Graham Crackers. Then make the recipe for Vegetarian Marshamallow Cream below. VEGETARIAN MARSHMALLOW CREAM (NO ANIMAL GELATIN) Enough for 2 dozen cookies. 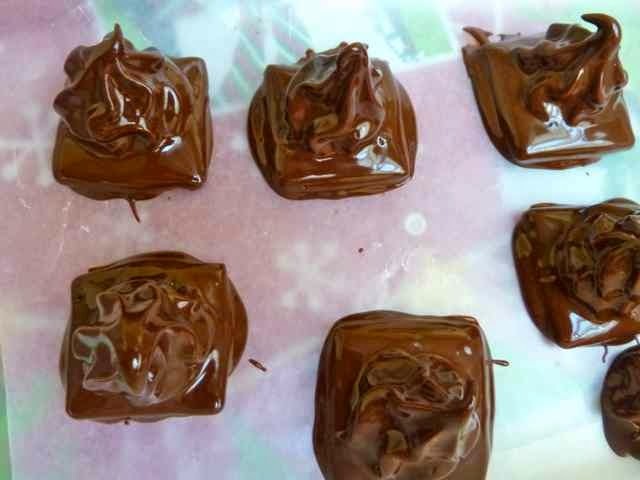 Ingredients 1/4 cup Water 1/4 cup Corn Syrup or Golden Syrup 3/4 cup Sugar (I used the evaporated cane juice crystals.) 2 Tbs. Unflavored Kosher “Jello” 1 tsp. Xanthan Gum 2 Large Egg whites at room temperature 1/4 tsp. Vanilla Extract Directions Line baking sheets with wax paper and place the cookies out on the baking sheets. It is necessary to have everything set up to pipe out the marshmallow cream quickly, as soon as you finish beating it. The marshmallow will set as it cools and become impossible to pipe out. In a small or medium saucepan combine the water, sugar and corn or golden syrup. Bring to a boil and continue stirring and heating the mixture until it reaches the temperature of 235 degrees or the ‘soft-ball stage’. Use a candy thermometer or an instant read thermometer to check the temperature. When the mixture is nearing the 235 degrees temperature mix the kosher ‘jello’ and xanthan gum together in a small bowl. Add the 2 Tbs. of water and mix well. Allow to sit. When the hot sugar mixture reaches 235 degrees remove the pan from the heat and place into the sink. Add the ‘jello’ and xanthan gum mixture to the hot sugar mixture and stir. Set aside. 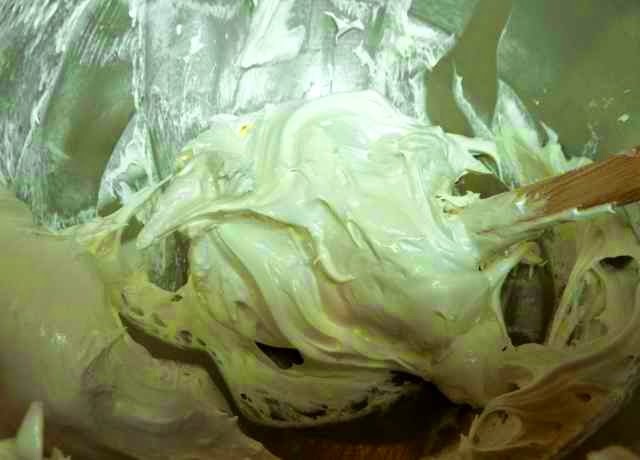 Beat the egg whites to the soft peak stage in a stand mixer or in a large bowl with an electric hand mixer. Add the hot sugar and ‘jello’ mixture to the whipped eggs and continue beating until stiff peaks form. This will happen much faster than with regular marshmallows so keep an eye on the mixer. 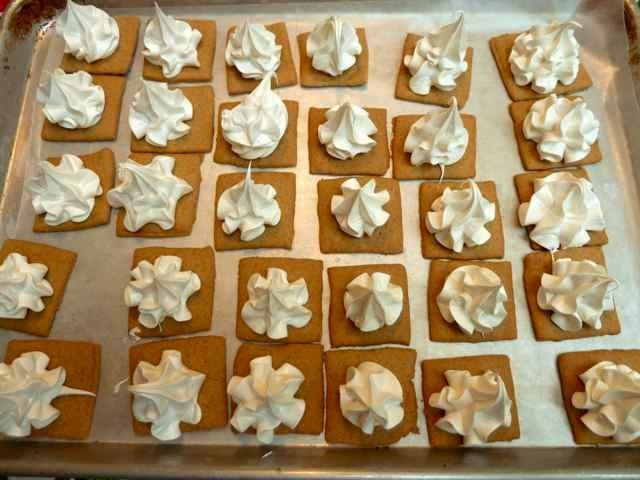 Transfer the marshmallow cream to a pastry bag fitted with a 1/2-inch round or star tip. You will probably have to refill the bag at least once to use all the cream. Pipe out mounds of the marshmallow onto each cookie. 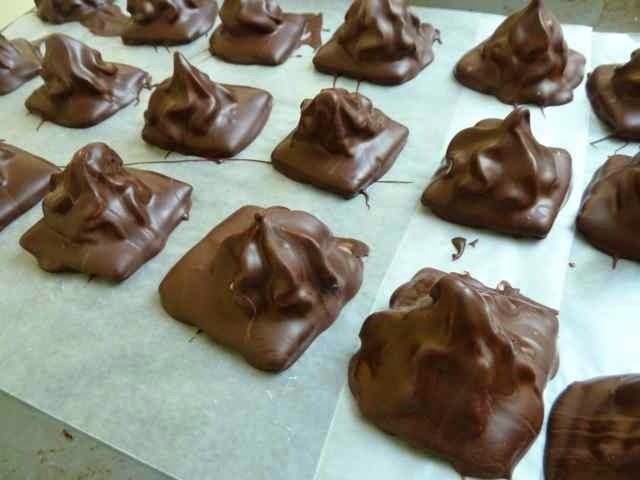 I made “kiss” shaped mounds with a cute pointy tip. Leave the marshmallow topped cookies to set at room temperature for at least 2 hours. Avoid touching the marshmallow as it will stick to you and anything in its path. Left over cream can be piped out into kiss shapes on wax paper that has been dusted with confectioner’s sugar. When these set dust the tops with confectioners sugar so that they will not stick to each other and store in the fridge in a baggie or container. These are great in hot cocoa or just plain. You can even dip some in the left over chocolate after dipping the cookies. C) After the marshmallow has set, dip the cookies in chocolate as per the directions on the GF Mallomar page. Enjoy!